Having a blog can have many benefits, and WordPress is one of the most popular systems for creating one. If you do not have any experience with website development, it can however be a very BIG task to figure out how to do it the best way and how to get started. I know how much time I wasted doing it the wrong way, when I first started. I will therefore in this article show you how to start a blog with WordPress. I will show what you have to consider before starting, the steps you need to take to get started, and I will even show you, how you can get a blog for free. What can a WordPress blog be used for? A blog can be great for many things. You might already have an idea about why you are interested in starting a blog. Building one in WordPress has its advantages, as it is fairly simple to use, it is easy to get started, and everyone can learn how to use it. So it does not have to be complicated to start a blog, as I will show you later step-by-step. A blog can be about any topic you are interested in. It can be a personal blog that you run and write yourself, and a blog can also be very useful for businesses and bigger companies. There are several things a blog is especially good for, if you do it right. A blog is an amazing way to generate more traffic to a website. I have written a whole article about how blogging can help to grow a business, if you want to know more details. One of the main ways it can help to grow a business is by generating more traffic to your website. This is not only great for an existing business, but for any website whether new or old. The main point of a website is tell visitors about certain things. Often with some kind of goal (for example a sale). Without visitors, a website is not worth much. Too many people however hear that blogging can be good for website traffic, but because they do not do it correctly, they do not get results. But if you use proper SEO, and focus on creating great content, blogging is one of the most effective ways to get a river of free traffic in the long run. Whether you already have a blog/website or do not have one yet, it can be worth thinking about the branding effect of a blog. There is a reason many of the big companies have a blog, where they regularly share awesome and helpful content. People share this, it helps the brand get out there, and it generates more traffic and potential customers. One thing to consider in this connection is the quality of your blog. I have seen people start a blog and write very poor content with no focus on quality but just on selling. If you do it like this, it can have a negative effect on your brand or your personal name, if people feel your are trying to cheat them or waste their time. But done correctly, blogging can be very good for branding. Whether you start a personal blog or a business blog, it is a great place to share advice and stories. Some blogs are very personal and tells a lot of personal stories. If you have a lot of things you want to share with the world, a blog can be a great place to do this, as it will be available worldwide. Yes, a blog can also be used to make money. For this to happen you however need to have the traffic I mentioned earlier. Once you have a successful blog with a lot of visitors, there are several ways you can earn money. For example through affiliate marketing, ads, sponsored articles, or if you have a business, it is a great way to get customers. So a blog can be used for many purposes. Whether it will become successful or not however depends a lot on your approach. There are a few things that are good to consider before you start a blog, to make sure you will not waste your time. What to consider before starting? Let me start by making it clear that it can definitely be worth having a blog. I know this for a fact, as I have created several successful WordPress blogs myself. If it is worth it or not however depends on a couple of things, and these are good to consider before starting, so you are sure you start with the right approach and expectations. First thing to consider is why you want to start a blog. It might sound obvious, but often people forget to really think about this. This reason this is so important is that this will lay the foundation of your whole approach. And if you know why you are creating it, you will be motivated to work hard and be willing to make the effort it takes to create a successful blog. This leads me to the next point to consider, which is time. Way too often people think it is easy to create a blog. They expect to just write a few short articles and then the visitors will flow in, and their articles will go viral. This can of course happen, but it will not happen for most of us. To create a successful blog is not a one time thing. It is something you continuously have to work for. If you only have 1 hour every week, you should not expect to be able to create a successful blog. How much work it takes to make it successful of course depends a lot on the other blogs within your niche/topic. But in general it only makes sense to create a blog and try to make it successful, if you take it seriously and are willing to work on it every week. Also, you should be aware that in most cases you will not have created a successful blog in just a few weeks or months. In most cases it takes several months before it start getting noticed. There are of course exceptions, but I am mentioning this, because I too often see people think it is just takes a few hours to set up, and then they will go viral. And it is important not to go into blogging with this approach, as you will then very likely be disappointed and give up. To keep motivated it is important to remember your motivation, and remember why you created the blog in the first place, and then keep working toward that goal. A blog is a part of the internet, as you are probably aware. What bloggers sometimes forget is that this mean it is available to everyone with access to the internet. What you share their can potentially be found by anyone with access to the internet. Having a blog gives huge opportunities, but it also comes with responsibility. So focus on doing it with quality and integrity – that is my opinion anyway. Before getting to the steps you need to take to start a WordPress blog, I just want to discuss free vs paid version of a blog. It is possible to create a WordPress website and blog for free. This is a great way to get started, if you are not sure, if it is for you and just want to test it out. The disadvantage of any free WordPress blog is that it will have a strange looking URL (website address). You cannot completely choose the URL you want. Example of how the URL will be for a free blog. As you can see on the image above, on WordPress.com a free blog will for example have wordpress in it. This is the same principle for all free blogs. If you are serious, and if you find out you want to do it properly, it can be great to get hosting and a domain you pay for, as you can then choose a more user-friendly URL and get a better performing website in general. It can be done very cheap, and I for example pay less than $14 per year for having amazing hosting and my domain at Wealthy Affiliate. So it can definitely be worth this investment in the long run. But if you are not sure about blogging yet, it is definitely possible to start a blog for free. 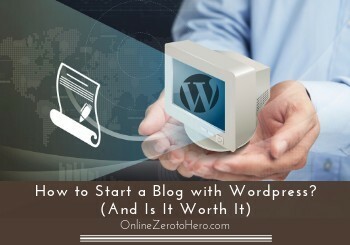 Now you know what a WordPress blog can be used for and what to consider before starting one. So let me now step-by-step explain what you need to do to get started. Maybe you already know why you want to start a blog. If this is not the case, you first need to choose a topic/niche for your blog. The more specific, the better. Sometimes people try to create a blog about all kinds of different topics at the same time. This can be confusing for both Google and people and make it more difficult to get good rankings and returning visitors. So try to choose as specific a topic as possible. You can always expand later. Before starting to build your blog, you need a domain name (website address) and hosting for it. As mentioned earlier, you can get started for free, if you want this. Just click the link in the section about a free blog above, if you want this. If you are more serious, you can decide to invest in a domain name right away. There are many places you can buy this. Personal I think the best place is Wealthy Affiliate, where I have this OnlineZeroToHero.com website. It is great, as it has amazing hosting, support, training, and more. But there are also many more places you can get a URL. Just remember that the cheapest option is not always the best option in the long run:-) Then it might be better to start with a free blog and then upgrade, when you are ready to get good hosting. Once you have your domain and hosting, you can start building your WordPress blog. The great thing about WordPress is it has different templates that makes it possible for you to create a nice looking blog and website without any coding skills. Once you have created the basic layout, you need to start writing blog posts. Content is of course the most important on a blog, and therefore you need to create quality content. It of course takes some time to figure out the design and how to create it, if you have never used WordPress before. And it also takes time to develop the skills to create good content. I have however placed links throughout this article to other articles that can help you further. You can also learn a lot by just trying out WordPress on your own. Before making that decision, it is however important to consider how much time you are willing to spent on just testing yourself, or if you need more training. Step 4 – DIY or more training? It is possible to create a WordPress blog just by trial and error. I did this in the beginning myself. It can however take a lot of time. Especially if you have not created websites before. So if you want to do it yourself, you need to be willing to invest a lot of time in just trying things out. In addition to creating the frame of the blog, it is also important to spend time learning how to find the right topics to blog about (what people actually search for), and do it strategically. I have seen many blogs where people just blog randomly, because they never thought about doing it strategically, and it rarely gives them any good results. You can find a lot of free info online about this, if you surf around. You can also check out some of the links in this article for more information. 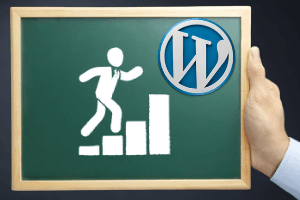 After having failed with creating a successful blog myself, I however found a step-by-step training program that provides both the hosting of the website and excellent training on both how to create a WordPress blog, and how you then use blogging strategically to achieve your goals. I honestly owe much of my success with blogging and online marketing to this training program. It is provided by the platform Wealthy Affiliate, which I have already mentioned a couple of times in this article. If you want to create the best possible foundation for a successful blog, this is in my experience the best place to get that. I personally love having a blog and the opportunities this gives. And WordPress is a great system to create one, as it is user-friendly and has the features any blog need. If you are considering starting a blog, just make sure to think about the things mentioned in this article. If you do this and go into it with determination, I am sure you will find the world of blogging and the opportunities it gives amazing – I know I do, and every day I see and learn new opportunities. If you have any comments, have any questions about starting a WP blog, or have any experiences yourself, I would love to hear from you in a comment below. I agree with you that WordPress is the best place to create to blog. Making money from a blog is depending on different steps, article writing, SEO optimization, keywords, patience, social media. I also have made many changes during my time as a blogger, and learned a lot from trial and error. Anyway, thanks for sharing your experience with us. It is very informative. Yes, there are many steps to make a successful blog, and it can take some trial and error for sure. Hi Mikael,I have a WordPress blog and absolutely love it. WordPress is definitely one of the best platforms to use for creating a blog or any website. They have a great variety of themes to choose from and thousands of plugins to use. Initially it does take a bit of time to get use to, but it is absolutely for non techies like me. I don’t know coding at all and with WordPress does not need to. I love your post and find it very interesting and informative. I have learned a thing or two. I can remember finding the right theme for me took a while because there are so many to choose from. What is you favorite theme in WordPress? Great to hear you love using WordPress Rika. It is definitely one of the most user-friendly website systems compared to all the others I have tried. There are many great themes. But my favorite theme is Divi, as it is very flexible and can do more or less what you want it to. It is the one I am using for this website. I like your honesty in what it takes in time and integrity to have a successful blogging career. WordPress is great and so easy to use. I remember a long time ago (turn of the millennia) I had a website and used Microsoft Frontpage and it worked okay. Now with all the extensive tools included with Wealthy Affiliate including WordPress it makes it so easy to start a blog and focus on quality content and relevant affiliate offers. I like everything about Wealthy Affiliate and WordPress. Great article and way to show the pluses to blogging, but also what it takes to be a success at blogging. Well done. Glad to hear you liked my article and also like Wealthy Affiliate as a place to learn blogging. Hi Mikael, thanks for an interesting read. I am still new to using wordpress and have found this all a little challenging. Your breakdown and the clear explanations have definitely helped with my own thinking around blogs and I am encouraged to continue with the knowledge you have shared in your post. Glad my post helped you Cass. It takes a little time to put all the pieces of the puzzle together. Just take it step-by-step and then you will be up and running very quickly. And let me know if you have any questions in the process, and I will be happy to see if I can answer. I have so far read so many blogs about how to make a own blog. Even though they give you some information none of them really gives you step by step info for starting your own blog. But this article has a clear and organized way for creating a blog. I’m really glad that I found this article. Thank you for your help. Very nice to hear Sujandar. This is exactly what I hoped to be able to help with with this article, so glad to hear it helped you. Wasnt that long ago when I thought a blog was just for people who new how to write code and so forth. Then through Wealthy Affiliate I was introduced to WordPress and the world of blogging. I also know now that anyone, given the right tools can do all the blogging they want as long as they are willing to use the tools. This was a great article. Thank you for all the great words. Yes, WordPress definitely makes it possible for everyone to start a blog. I have however also seen many people start one without approaching it seriously and then it kind of just dies out within a few months. 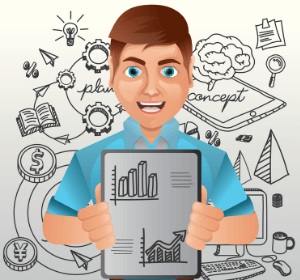 To really benefit from it, it needs to be consistent and done with focus on quality and SEO. So glad to hear you are following the training at Wealthy Affiliate, as it will for sure show you the right steps and process. Good luck with your blog and let me know, if you have any questions about it in the process. I have read so many blogs over the years and it did get me thinking about making my own blog. I had no idea how to do it or if I even should. I felt so overwhelmed with the amount of tips on how to make a blog that there is online. Your blog was straightforward and told me what I needed to know to make a decision. Thank you. Glad to hear that. Thanks for the feedback, and good luck with starting your blog. feel free to let me know how it goes. Would be great to hear.